The Blackwood Hills Circle of Friends (CoF7) is a community group formed to provide support and friendship to refugees and asylum seekers. The current political climate highlights the importance of the group as one of the faces of Christ in the community, and therefore we will work in partnership with them, particularly through the English Lanugage Assistance Program. to support refugees in the community. to raise public awareness of issues affecting refugees. to make life more bearable for people in detention centres. 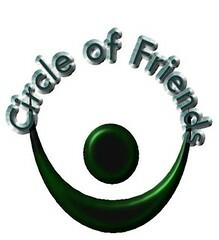 The Blackwood Hills Circle of Friends is a community group which meets on the first Wednesday of each month. Note: A light supper is provided at the end of our meetings. We have many supporters who do not attend our meetings, but contribute in other ways. Because asylum seekers seldom have the money needed to establish a home when they are eventually released into our community, we need to raise funds to help them. Many of our members make direct donations, and we have held a number of successful fundraising events: quiz, dinner, catering for other functions, etc. Members have also donated furniture, groceries and services. We offer support to those are trying to understand our culture and settle into our society. We urge those who represent us in state and federal parliament to press for fairer treatment for refugees. Many refugees have suffered years of trauma already. Please visit Australian Refugee Association (ARA) website for more information. 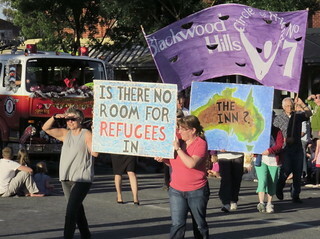 Each December, we participate in the annual Blackwood Pageant to raise the profile of refugees. Please join us or watch for our group in the parade. Please contact John Shepherd (jandbshepherd@ozemail.com.au, telephone 08 8387 8940) or Barbara Brown (blackwoodbarbie@yahoo.com.au, mobile 0401 416 550) or just come along to one of our meetings.